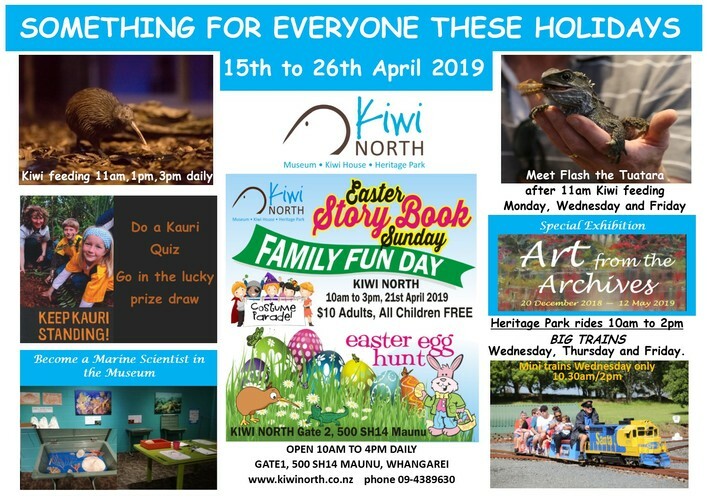 Kiwi North has something for everyone these school holidays! Explore the museums treasures, become a marine scientist or do a Kauri Quiz to go in the prize draw. Kiwi feeding is at 11am, 1pm, 3pm daily. And meet Flash the Tuatara after the 11am kiwi feeding on Monday, Wednesday and Friday. Heritage Park rides are at 10am and 2pm on Wednesday, Thursday and Friday for the Big Trains. And Mini trains are at 10.30am or 2pm on Wednesdays only. Story Book Easter Sunday is a special event day with a visit from Clifford the Big Red Dog, Caro’s Crazy Critters Animal Farm, Pony rides, Train and tractor rides, Face painting and the Whirlitza Merry-Go-Round. 10am-3pm Sunday the 21st of April $10 Adults, children free - Museum, Kiwi House and Easter egg hunt included in the entry fee.